It's rare to see a WiiWare game push the graphical boundaries of the format to an extent where you forget it's a download title, so when a game does exactly that, it's enough to turn heads. That's the kind of impact Jett Rocket has created and the latest trailer shows the game in action, centred in the Atoll Region. 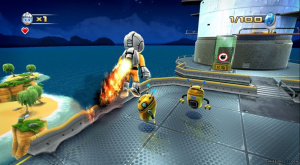 The trailer shows some of the gameplay mechanics that players will have to master if levels are to be competed, such as flinging yourself from flexible bars to gain extra height and maximise the jet pack's capabilities. To find out more about the development process of Jett Rocket, be sure to read our interview with the CEO at Shin'en Multimedia and if you want to know more about the intricacies behind the character modelling and more, you can check the first of three development blogs. Yes, the graphics look nice, but Shin'En's problem has never been graphics. It's that their games feel like watered-down versions of better games. And this one will likely be Ratchet & Clank, only worse. Looks absolutely awesome. Can't wait! I saw a ground-pound, fake star bits, and triumphant end-level animation. We clearly know Shin'En's inspiration... now if they can accomplish 1/10th the gameplay of Galaxy, I'll be shocked and amazed. And excited. Looks pretty cool. "And this one will likely be Ratchet & Clank, only worse." WTF?!?!?! How does this look even remotely like Ratchet & Clank? With some Mario Galaxy mixed in. Wow, this is a wiiware game? i am definitely watching this. I'm still in disbelief that they can put all that and more in 40 MB. Obviously, Galaxy has become the standard for platforming, so every 3D platformer here-on-out is going to have some similarities to it. This one looks good. A nice, solid looking 3D platformer for WiiWare. @Nintendo-Naut...actually Galaxy was inspired by a previous Ratchet and Clank game believe it or not. Galaxy wasnt the first to do the whole round planet gameplay. Ratchet and Clank: A Crack in Time very well set the bar right up there with Galaxy as well. Well, Miyamoto said he'd never heard of Ratchet and Clank. He thought it was a PC game. Now back on topic: this game looks very very good graphics wise and the gameplay seems to be of the "Mario 64" mold which is always great. Still waiting for a price point and release date. Developers are aiming for 1000 points. The graphics style looks very similar to super mario galaxy but the gameplay looks like it stands on its own and actually reminds me a bit of beyond good and evil with the variety and water stuff. Anyway looks quite good so far. No, the gameplay looks almost exactly like SMG. That's a fine thing to mimic, but SMG2 has set the bar so high that this will feel pretty simplistic in comparison. Hopefully the difficulty will be really high. Looks pretty good. I shall be keeping my eye on this one. Im not just liking the visuals but the graphic style. The worlds look fun and interesting. Not dark and gloomy. I'm still super excited for this one. I've said it before, and I'll say it again, my only concern is that all this hype and all this effort is going to end up amounting to just a few hours of gameplay. Ideally, I'd really like to be able to punch out 5+ hours of challenging, interesting gameplay. Looking fantastic! The similarity to SMG(2) will likely work to this game's advantage for my gaming dollar. As brilliant as SMG2 is, and as inevitable that I'll buy and play it eventually, I don't have the time or money to invest in a huge platforming game in the near future. However, a bite-sized (and priced) bit of goodness will fit the bill and keep me satisfied for a good while... barring any horrible reviews, I'm sold! This looks like pure epic pwnsauce! How the hell is this a download title!? Looks like Mario with jetpacks. Epic.